Knowledge of the total mercury content in volatile liquid hydrocarbons and condensates is extremely important for the following reasons: firstly mercury is highly toxic and is of environmental concern, and secondly it can cause damage to natural gas and petrochemical installations which can be financially crippling, especially when unscheduled shutdowns are forced. To avoid potential damage, many companies install mercury removal systems to ensure the important parts of the plant are protected. This means periodic measurements of the outlets of these removal systems need to be made to ensure they are operating correctly. The inlet concentrations also need to be checked to help calculate the expected life of the removal bed. As these measurements are critical, the frequency of measurement needs to be high therefore the preferred method of obtaining this data is by using online instruments. As gas and petroleum installations have to meet specific requirements, the PSA Online Natural Gas systems are similarly specifically engineered to customer requirements for both measurement and control facilities for the measurement of mercury in liquid hydrocarbons and condensates. The Online Liquid Hydrocarbon systems are based on two modules, the PSA 10.690 Mercury Preconcentration system and the PSA 10.670 Process Analyser. The PSA 10.690 Mercury Preconcentration system has been developed from the PSA 10.515 Mercury Preconcentration system which is used for the single analysis of mercury in volatile liquid hydrocarbons, condensates and gasoline. 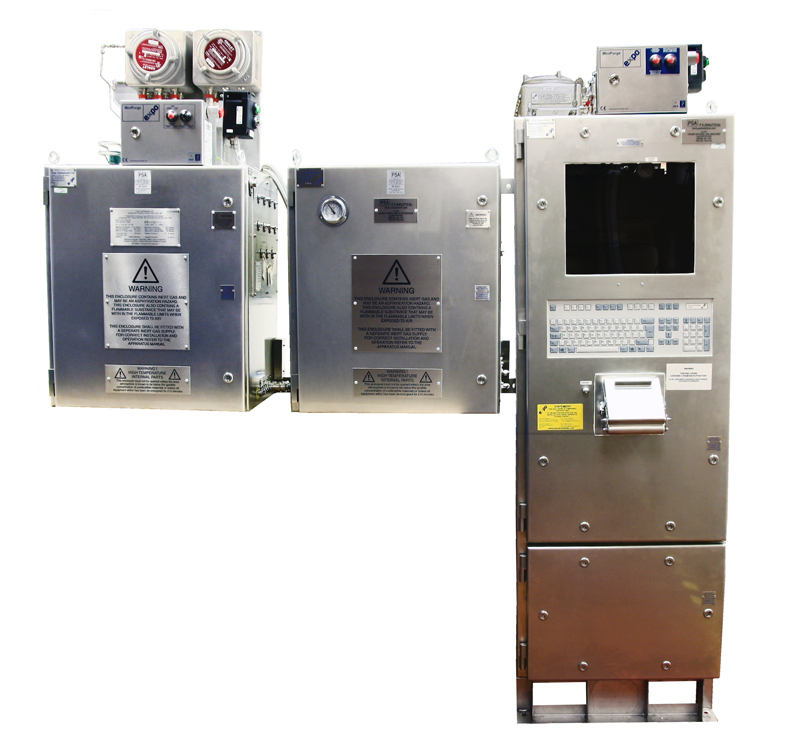 The PSA 10.690 Mercury Preconcentration system is physically divided into two interconnected purged cabinets and has been designed to operate in hazardous areas using electrical components certified to explosion proof rating. Systems can be built to handle multiple channels. The heart of the PSA 10.670 Online Analyser is the PSA 10.525 Sir Galahad mercury analyser operating in dual amalgamation mode. The system also contains a stream selector unit (for multi channel operation and automatic calibration) and an automatic calibration system PSA 10.536 Hg Vapour Generation and an industrial computer with monitor running the PSA Online Software all housed in an optional purged enclosure. The system can be expanded to simultaneously handle the online analysis of mercury in natural gas by the addition of the appropriate PSA 10.54X Online Sampling System. Online analysis of mercury in volatile liquid hydrocarbons and condensates is becoming more in demand particularly from the new sources of supply. To discuss particular requirements and for more detailed information on the above products, please complete the Information Request Form.